Sarah Blatt ’16 is working with Oldinski to create a jelly to see how well it will mimic the properties of the inner region of the human spine. Normally, this nucleus pulposus gel is the shock absorber within the discs between each vertebra. “But in disease, that jelly leaks out,” Oldinski says. So, as a senior project, Blatt is looking for a “material replacement,” she says. “We also work, literally, with snot,” Oldinski says with an unguarded smile. “We have several projects that use hyaluronic acid,” the clear goo that the body creates to lubricate joints, shape eyeballs and, yes, “it’s snot,” Oldinski says. Underlying the great-fun-with-squishy-stuff ethos of the lab, Oldinski has a deadly serious set of goals. One is to do basic work on the mechanics and chemistry of these various goos, a family of materials called hydrogels. “Can we create products that are smart—that are responsive to changing pH or temperature or biological conditions? Can we create products like skin, that stretch and reorganize themselves over and over without failing?” Oldinski asks. On the other side of the bench from her, doctoral student Spencer Fenn squirts a purple blob of alginate onto a glass slide and spins the slide inside a small centrifuge. Fenn has been spearheading a research effort to use alginate gels to create a kind of Band-Aid for the lung. Whether from a car crash or disease or battlefield injury, once a lung is punctured it is difficult to seal and heal, since it is constantly inflating and deflating. He and Oldinski and others in both UVM’s College of Engineering and Mathematical Sciences and College of Medicine have developed a patch that looks promising for clinical use. Once it is freeze-dried, a surgeon will be able to cut a piece of the hydrogel, apply it to the wound and let it rehydrate from the body’s own water. Then, using a scope with a green light, transform the goopy patch into an adhesive lung sealant. This innovation promises to be non-toxic and a recent study by the lab team shows that the patch can withstand lung-like pressures. But Oldinksi’s top goal for developing hydrogels and other engineered biomaterials is to find better forms of drug delivery, particularly for cancer treatments. Fenn holds up his slide to the light. It glows a faint pink. “It’s red because of doxorubicin hydrochloride, which is a chemotherapy drug,” Fenn says. He’s mixed the drug into the alginate patch, as well as into alginate microparticles—that were also mixed into the liquid before being treated with the green light. “It’s a hydrogel inside a hydrogel,” he says. The nanospheres Miao created are “really ninja beads,” Oldinski says. Recent reports show that a naturally occurring protein, called fibroblast growth factor 2, that sends signals on the outside of cells, behaves very differently—if it gets inside a cell. There, it can function like a hormone to inhibit growth and kill cells—including cancers. Using this knowledge, Miao and Oldinski mixed the growth factor into a highly engineered form of their alginate meatballs, called alginate-graft-PEG, and then released them into a sample of human lung cancer cells. The scientists were pleased and amazed that the nanospheres slipped past the cells’ surface receptors for the growth factor—and got inside. There, the tiny alginate balls moved to the cells’ nuclei “and released their bomb: the growth factor,” Oldinski says. “It kills the cancer.” In Montreal, on May 19, Tianxin Miao presented the team’s results to the World Biomaterials Congress. 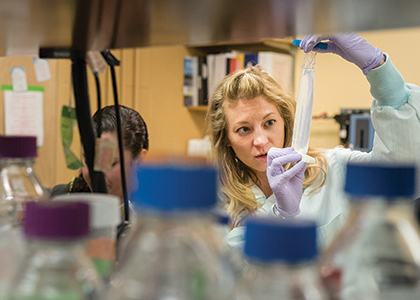 It’s a “stealth mechanism,” she notes, that shut down the growth of the lung cancer cells.